If you want a holiday to get away from it all in a beautiful seaside resort then Torrox could tick all the boxes. Torrox has been given the distinction of being the healthiest town in Europe and this has been scientifically proven. Torrox is known for its laid back way of life. If you need a little more action then visiting neighbouring Nerja with its beaches is a must. Torrox and Nerja are a far cry from the most popular resorts on the Costa del Sol like Marbella, Malaga, Puerto Banus and Torremolinos. Are you an expat in Torrox? What do you like/dislike about it? Let us know in the comments box at the bottom of the page. Torrox is very popular with German tourists but lately the British are discovering this lovely beachside resort. The city itself is divided into two sections: Torrox Costa on the sea and Torrox Pueblo inland from the coast. Torrox is situated off the N-340 coast road and the AP-7 Motorway. The old town of Torrox Pueblo has a long history but most people will visit the separate coastal beach area of Torrox Costa and Punta de Torrox which are completely different being modern beach resorts. The pretty white-washed village of Torrox Pueblo is located in the area of La Axarquia, 145 metres above sea level and surrounded in the background by the Tejeda and Almijara mountain ranges. To the east of Torrox nearby towns include Punta Lara Canamiel before you hit the town of Nerja with it’s beach areas of La Torrecilla, Playa del Salon, La Almijara and Playa de Calahonda. Heading west of Torrox towards Velez-Malaga and Torre del Mar you come across the towns of Santa Rosa, El Morche, Huit, Lagos, Mezquitilla, Algarrobo and Algarrobo Costa and then Camarillas. We also have photos, picture galleries, views, videos and Torrox webcams so you can see what Torrox has to offer you for your Torrox holiday. We also have help and information to those people who are looking for Torrox property or Torrox properties. There are lots of properties for sale in Torrox mostly Torrox apartments and Torrox villas. One of the most popular apartments you can rent are the Complejo Laguna Beach in Torrox Costa. Directly beside the sea, the Complejo Laguna Beach apartments are close to the town centre with plenty of shops, bars and restaurants nearby. For Torrox Pueblo hotels try the Hotel La Casa, the Rural Cortijo Amaya and the Alandalus. For Torrox Costa hotels try the SR Hotel Torre Arena or the SR Hotel Santa Rosa. Historically Torrox was of strategic importance as it was the harbour exporting silk between Granada and the Near Eastern cities of Baghdad and Damascus. The Romans settled here calling it Faro or Punta de Torero, you can still see some Roman ruins to this day including a bathhouse and necropolis. 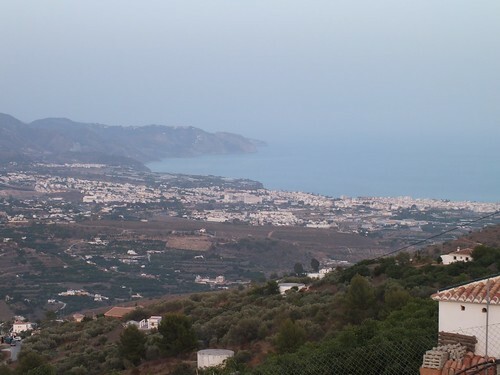 Situated in the souther area of La Axarquia, pretty Torrox village inland from its coastal resort sister Torrox Costa is framed by the Tejeda and Almijara mountain ranges and 145 metres above sea level. Torrox is situated on the eastern Costa del Sol in Spain at the foothills of the Sierra de Almijara mountain range, and enjoys a fabulous climate with an annual average temperature of 18 degrees centigrade. Torrox is very picturesque and rural with vineyards and olive groves as far as the eye can see. Torrox is a typical seaside resort with a beautiful beaches and a promenade with shops and boutiques and bars and restaurants. Be sure to order your Menu del Dia or maybe try the regions speciality of sardine kebabs washed down with a bottle of local wine. The most popular fiesta in Torrox is the Migas Fiesta which is held annually on the last Sunday before Christmas. More than 40,000 people attend this fiesta in the village square. Migas is cooked in huge pans with music and dance and large amounts of wine. While enjoying your vacation day trips can be made to Seville, Cordoba, Frigiliana, Ronda, Gibraltar and Morocco. A trip to the weekly market for your fruits and vegetables or take home a souvenir of lace or leather completes a holiday to Torrox. We could say what is an advantage for everyday life can be a disadvantage for some people. The quietness means there are not much fun for young people, no discos nor good pubs with music where you can dance. The choice of shops available in Torrox is improving all the time. 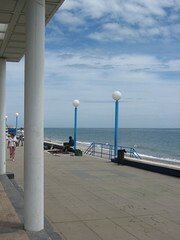 Most of them are situated on and around the promenade. In addition to the usual selection of tourist souvenir and supply shops Torrox now has five major supermarkets. However there are neither superstores nor clothing stores. Some years ago, according to the latest figures from the ‘Padrón Continuo’ around 60% of the population were Spanish. But in the last three years, Torrox saw a decline in their population for the first time in 17 years, mainly due to the departure of foreign residents who are getting older and selling their properties. Nowadays it has a 16% loss in population. Being a relaxed, family friendly resort, perfect to enjoy a holiday in the sun away from the busier resorts does not mean a boring place. Torrox area has a quality of life that is hard to beat with the best climate for the outdoor style of life. There lots of possibilities of practicing sports such as golf, tennis, horse-riding, skiing, wind & kitesurfing, mountain biking, rock-climbing, hiking, fishing, playing golf – the list goes on and on, the same as water sports such as diving, scuba, waterskiing… We recommend Black Frog Diving. For lovers of stronger feelings, paragliding may be a good option. If you enjoy walking, there are guided routes for the lovers of trekking from October to May in the Trekking School. You can also try the refreshing Chillar River route with a group of friends, climbing, horse-riding, mountain biking or driving a quad bike in Sierra Tejeda and Almijara. There’s a couple of golf courses: Baviera Golf in Caleta del Sol, Vélez Málaga, only 10 kms away from Torrox and Añoreta Golf around 30 kms away. There is year-round scuba diving at Marina del Este and great access to the ski resort Sierra Nevada at Granada. Torrox Costa is well served with good restaurants offering food for all tastes. There are lots of bars and restaurants all along the Paseo Maritime along with traditional bars in each of the side streets leading down to the beach and all along the main road. Some of our favorite places to eat are La Farola, Chiringuito Pepe Rico, Pizzeria Giuseppe, Taj Mahal and Assador de Pollos Elena. There is also a variety of places that offer homemade food with daily menus at very reasonable prices and good quality such as Bar Fernando, Bar Avenida, El Caballo Blanco and Restaurante Asiatico. You cannot leave without eating one or two espetos of grilled sardines in any of the chiringuitos along the Torrox Costa beach. There are also Irish, German and English-run bars with traditional food, sports and music. At night there is good music at Caipiriña and Mambo, and also live music and dancing in Hotel Iberostar Málaga. Torrox Pueblo is much less cosmopolitan but there is a reasonable choice of Spanish-run bars to eat around the main square, such as Bar La Plaza and La Biznaga with plenty of space for outside sitting under the orange trees. Torrox costa is well provided with two health centers, one on the coast and another in the village. Moreover, there are three private clinics on the coast with English and German speaking doctors. Regarding dentists there are several dental clinics with very good dentists such as Costa Salud Dental and Clinica Dental Torrox on the coast as well and some others in the village. Almuñecar International School is 25 kms away but it provides a bus collection and delivery service to Torrox. There is also another international school in Añoreta, Novaschool. Torrox is a very quiet place to live. No crime, you can walk along the streets without a worry. We can tell you we have never been assaulted or robbed. We have never felt unsafe in our neighborhood nor have we witnessed any crimes. There are however some attempts of petty thefts. You must be vigilant and keep an eye on your personal possessions, especially when visiting crowded places and don’t leave anything of value visible to potential thieves. From an investment point of view, the fact that prices are off the floor there is still potential for capital growth before prices are back to where they were. Although the prices have timidly gone up, we do not think they will increase much in the next few years, so it is a good time to invest in property market. Taking into account that properties on the east side of Malaga are cheaper than on the west side, we can still find worthwhile properties with reasonable prices. Moreover, it looks like Spanish banks are getting more interested in mortgage lending, which is important for any housing market recovery. There are repossession opportunities available in all areas of the Costa del Sol and at all price levels, starting under €100,000 and with finance of 80-90%, and in some cases even 100% available. We are agents of Caixabank in the area and have sold lots of properties. At the moment there are some more to be sold very soon. There are some urbanisations all along the promenade, all of them with well maintained mature gardens, pools, tennis courts, with easy access to the beach and services such as Centro Internacional, costa del Oro, Euromar and Laguna beach that has also a heated pool, paddle courts and petanca. The complex Punta del Faro is within walking distance to the promenade and offers good quality apartments with large terraces with sea views in a tranquil position. The complex El fuerte Calaceite is two kilometres away from the promenade, off the road to Nerja, and offers good quality apartments with large terraces with the most incredible sea views. The complex Torrox park is 2 kms inland and you can find there the quietness of the countryside together with the services of the coast within walking distance. How much are the typical property prices in Torrox for apartments, villas etc? Property prices are lower in the east of Malaga and the Torrox area is less spoilt by tourism, untouched by development and surrounded by an impressive scenery of mountain range. Planning regulations are now very strictly enforced in rural areas and those who are actually seeking a lifestyle purchase inland represent a very small segment. Torrox area is one of the most affordable villages on the Costa del sol. There are studios starting at 65,000 euros. Any tips and advice to people looking to buy in Torrox or surrounding area? Torrox area is perfect for people looking for spectacular, panoramic sea views and an authentic Spanish environment. If you are not in a super-expensive front line position in the let´s say Marbella area, then the best views of the Mediterranean are from the hills several kilometres inland. In this area, with the mountains coming right down to the coast, panoramic sea views are possible being just metres from the coast. Torrox enjoys the best micro-climate on the coast with the mountains behind giving protection from winter winds. The climate, the beaches, the good food and tapas, the cheap prices, the friendly people of Torrox … together with available flights to the major cities in Europe, this is what attracts more tourists and investors to the area. So come to enjoy one of the best climates in Europe with the best beaches around the world. Raquel, thank you so much for taking the time to help our readers with your experiences in Spain. If you want to contact her, you can find her details below. Torrox Tourist Information and help from the Town Hall, Address: Plaza de la Constitucion 1 29770, Torrox. Telephone. 952 538 200. Torrox Page Summary – This page contains unique content about Torrox Pueblo and Torrox Costa on the Costa del Sol of Spain close to Nerja. Please help us to make this the number one tourist resource for Torrox by adding any comments, reviews, ratings and feedback on any aspect of Torrox that you know about. We also welcome your photos, pictures and videos of Torrox for posting on our website. We have a brand new equipped fully fitted and Air-conditioned 2 Bed ground floor self contained apartment in a locked Gated and secure safe Farmhouse ( including Private Parking), 2 minutes walk to Town Centre; (Churro Kiosk) and only another minute or so walk to Seafront. We want to rent it long term from just €500 a Month (cheapest , but negotiable upwards); for Minimum 2 Months Rent, or even 3 Years for suitable people. Most Agents are not interested, as they want Holiday Lets, or Sales, or not interested in anything on the other side of the Sea Front. Few who were “apparently” interested, are just a sham and a joke, as they do not bother to advertise it. We even walked into one of them with our listing and asked them about long term rentals, and they said they had none! (What a Joke). If you can help us out, that would be much appreciated.